Robe Show Lighting launches the ‘Funky’ and the ‘Fusion’ – the latest in its new Club and Bar (C&B) series of lighting fixtures. These are aimed at smaller clubs, bars, restaurants and multi-purpose social environments of all types. The C&B Series is highly affordable, and offers all Robe’s renowned features and functionality, plus quality Robe engineering and a robust build. Robe brings these products to the market after considerable research into what types of fittings venue owners, operators and managers are looking for. The C&B series is designed to address the issues of good value, a dynamic range of effects and low maintenance. The first effects projector in the C&B series is the Fusion, a fully DMX controllable fixture that projects tightly focused flower shapes and other graphics effects in a lively array of colors. Fusion has a series of new and original gobo designs, and includes a parabolic mirror reflector that rotates in both directions for the quick creation of exciting kaleidoscopic patterns. Its combined gobo/color wheel has 14 positions plus open, and the lightsource is a powerful 250W halogen lamp with 1000 hour lamp life. 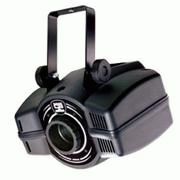 For full flexibility, Fusion also offers a strobe effect, 0 -100% digital dimming and "auto" or "music-trigger" modes. It uses 3 DMX channels, and can operate in either Master or Slave modes. The expedient size and 7.5 Kg weight makes the Fusion ideal for fitting into environments where space is tight or there’s a low ceiling. The second projector in Robe’s C&B comes with a parabolic multi-colour mirror reflector and an effects-wheel for creating a multi-colour flower effects. The combined effects/gobo wheel includes 7 static gobos, 3 beam reducers and an open slot. Both reflector and effects-wheel in the Funky have variable speed rotation in both directions. 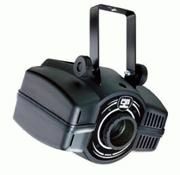 There’s also a strobe effect and 0-100% digital dimming. Lightsource is a powerful 250W halogen lamp with 1000 hours of life. Control options include "auto" or "music-trigger" as well as DMX, of which it takes 3 channels. It can also be operated in either Master or Slave modes. The Funky is identical in weight and dimensions to the Fusion, and so is perfect for all types of installations where space is at a premium and an unobtrusive fittings are required.